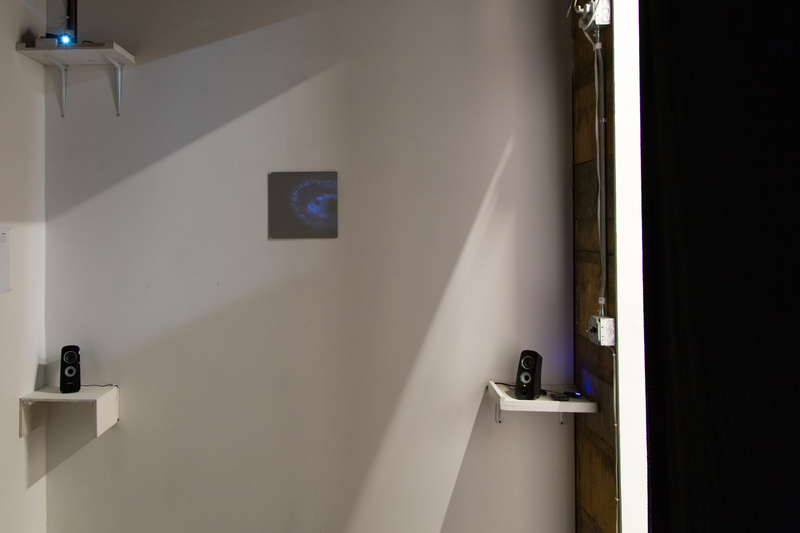 In the downtown district of Oakland, California, sound artist Ingibjörg Friðriksdóttir opened her latest installation work, Reflecting, in a group exhibition at the Ctrl Shft Collective, Traslación. 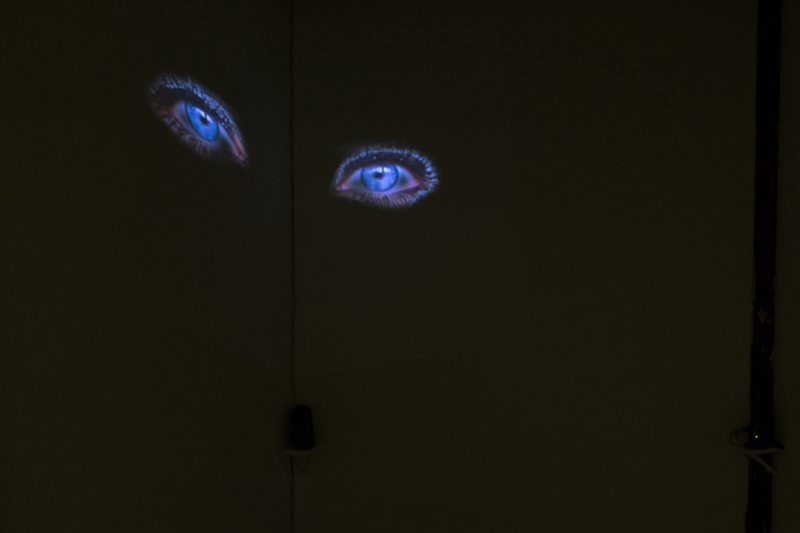 Entering into a urban warehouse building, piercing blue eyes blink out at the viewer from a projected video screen in a black box room. There is a subtle overlapping chatter, conversation from that of a fortune teller woman. The viewer is bombarded with sound from all corners, and one can almost picture the kitch fortune ball and tacky decorations. There is an element of ‘otherness’ and yet an immediate relatability to this voice. We know her, this woman, without having to know her, her vague and generic fortune tellings to which one is so desperately prepared to apply any aspect of truth or meaning to our own lives. Ingibjörg Friðriksdóttir is an Icelandic artist who defines her practice as somewhere between a composer and an installation artist. Ingibjörg has worked collaboratively throughout her career with filmmakers, dancers, visual artists, fashion designers, and photographers. She recently moved back to Reykjavik after completing an MFA at Mills College and working in the Bay Area for three years. When she first moved to California, Ingibjörg describes ‘listening’ to the culture to learn its rules, history and sensitivities; “I had to listen to learn, to be able to form my own opinions in that culture and I had to learn that even though I felt very foreign in this culture, I would be a portrait as a certain type of human based on my gender, my ethnicity etc. You have to learn what is expected of you as that person you are seen as, even if you feel you don’t have anything in common with the group you are now categorized within.” Whilst Ingibjörg’s home roots are in Iceland, her practice is quite dually based, and I found it compelling to learn how she navigates, professionally and personally, between these two worlds she has laid claim to. 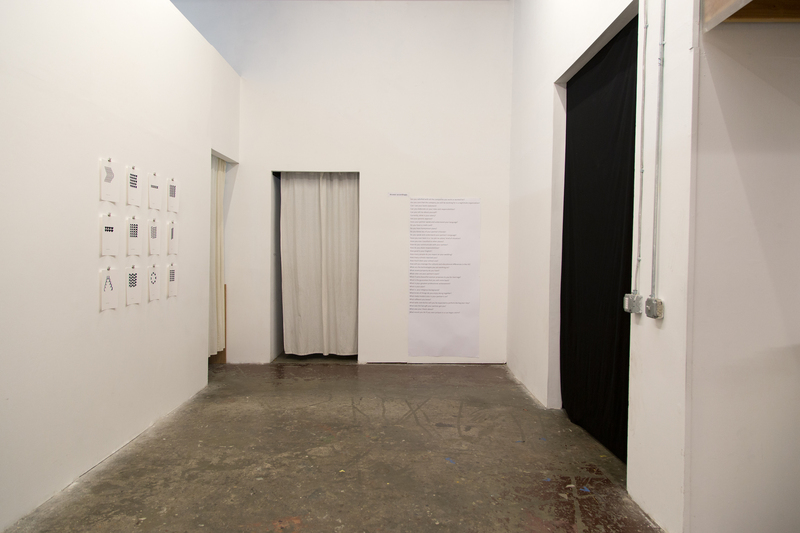 Ctrl Shft is an artist run organization and non profit art collective in the center of Oakland, providing artist studios to members, who pay rent and collaboratively put on exhibitions in the common exhibition space. The urban warehouse building is located in the downtown center of Oakland, and is almost hidden from the street, with no visible sign or marker. A new visitor wouldn’t quite know what to expect upon entering this experimental art space, as I didn’t. The collective and its members is largely queer and nonconforming to binary and heteronormative stereotypes, working to represent marginalized communities in their studio spaces. Ctrl Shft feels reminiscent to OPEN, Nýlistasafnið, and Kling og Bang, to name a few artist collectives in Reykjavik that are achieving similar success. 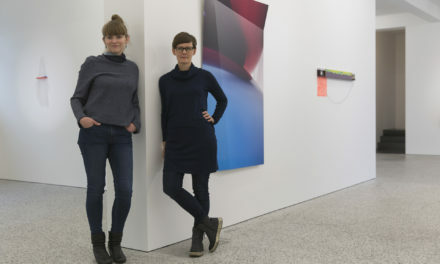 However, community oriented, artist studio and dually functioning exhibition spaces are few and far between in Reykjavik, especially those that specifically attempt to bridge the gap between marginalized communities and professional art opportunities. 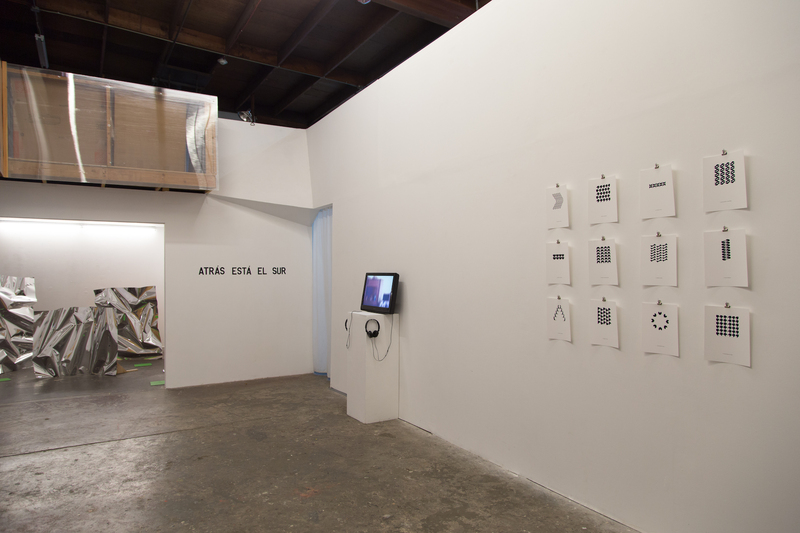 The show, Traslación, was co-curated by Colombian artist Susana Eslava and Carolina Magis Weinberg. Susana moved to the Bay Area in 2015 through an MFA grant, and is currently developing projects between Bogotá and the Bay Area. Her practice is interdisciplinary and explores themes of migration, colonization, and the intersections between social relations, art and politics. Among the participating artists were Ingibjörg, Susana, Carolina, Ana María Montenegro Jaramillo, Enar de Dios Rodríguez, Shaghayegh Cyrous, and Patricia Leal. All of the artists are international to the Bay Area, but share the common connection that each has based their practice here in California at some point along their journeys. 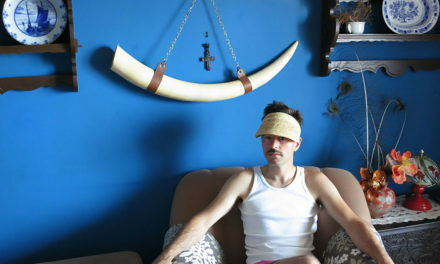 The exhibiting artists in Traslación, as Susana explains, are “in a state of otherness. They think in different languages, and create in a constant state of translation. They create in the impasse of the outside…engaging into conversations about what it meant to have an art practice –and a life– from a dislocated position. Traslación refers to the circular movement of a planet around a gravitational force which inevitably, takes it back to its initial position.” The exhibition explores thematics of inside/outside relations, acceptance, nativeness, discrimination, and belonging. Issues of gender, power dynamics, identity, locality, and politics are at play. 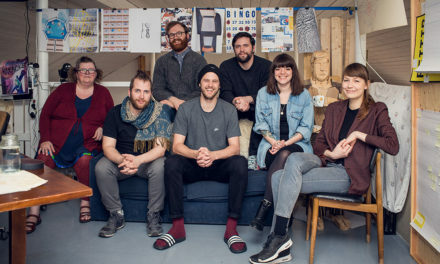 These elements provide an effective connecting point to art life in Iceland, where so many feel like a constant outsider to Icelandic culture despite maintaining an artistic practice in the country for many years. This struggle is universal, apparently, for acceptance and belonging, to be from somewhere. How do we belong to and from any place? Daria Andrews is an art writer and has received MFA education in Curating and Art History from the University of Stockholm, as well as holding a BA degree in Rhetoric from UC Berkeley. 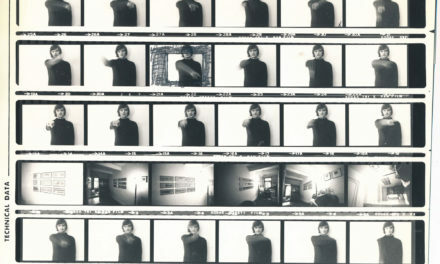 Andrews is the director of Studio Sol, an experimental exhibition space in Iceland. She has worked with various curatorial projects in San Francisco, Reykjavik, and Stockholm, like the IASPIS Open Studios Program in Stockholm, and a collaborative exhibition with the fine arts academy Konstfack in Stockholm. Daria views herself and her practice and globally based, navigating the political capacities of art, with an emphasis on the photographic medium. In her writing and research she focuses on essential tools of expression and communication within our cultural and visual world, working to understand how functions of power and persuasion are manifested in different creative outlets, like contemporary art and film. Her passion lies in examining art and its emotional impact in a critical, public context.